Percutaneous intervention (PCI) for chronic total occlusion (CTO) is a complex procedure requiring specifi training, which has been an obstacle to its widespread use. 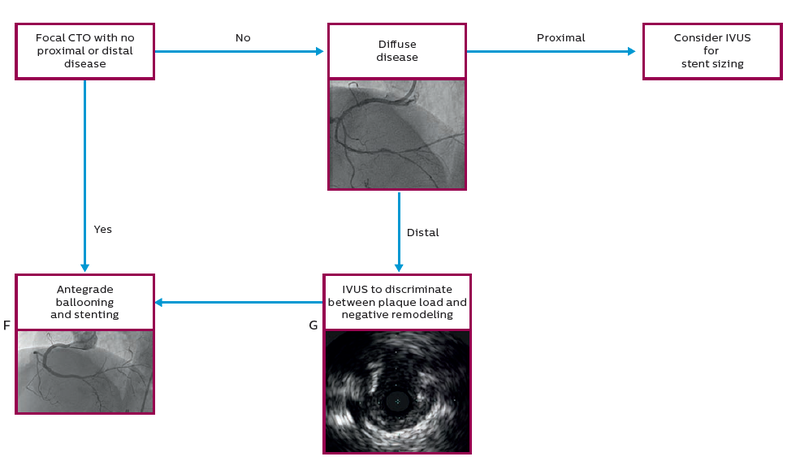 Intravascular ultrasound (IVUS) is a valuable technique for assessing the anatomy of complex coronary lesions. In this white paper, evidence supporting the use of IVUS in the assessment of CTOs is presented. 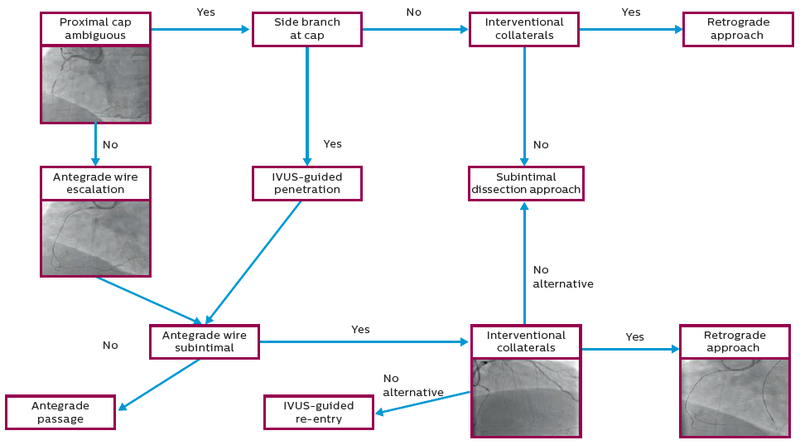 In addition, the author introduces a workflw algorithm that can help support research and clinical decision making for diffrent scenarios of IVUS use in the CTO setting. The publication of this information was supported by Philips Healthcare. Angiography provides a two-dimensional image of contrastfilled lumen, which does not allow an accurate assessment of the plaque.8 By contrast, intravascular ultrasound (IVUS) provides cross-sectional images of the coronary artery, enabling measurement of luminal and vessel areas and thus providing valuable anatomic information about the coronary arterial lumen, wall, and plaques that cannot be assessed by coronary angiography alone.9 IVUS can be useful to clarify anatomical structures that cannot be satisfactorily identified by angiography alone, especially with an ambiguous position of the proximal occlusion cap. It is also particularly useful in complex CTO procedures when the course or position of the retrograde wire has to be identified. After opening the occluded artery, the final dimension of the distal vessel is often underestimated, and the sizing of the stents based on angiography alone may lead to underexpansion. Here, IVUS-guided stent implantation may result in improved long-term outcome. Most experts agree that IVUS guidance improves the quality and outcomes of PCI. However, its use has been limited by a lack of appropriately powered randomised trials to provide robust evidence of the benefits of IVUS-guided PCI on clinical outcomes. Current European guidelines recommend the use of IVUS in PCI for all patients undergoing stent implantation optimisation (Class IIa, level B).16 IVUS is only used in a minority of CTO cases; in the 2011 European Registry of Chronic Total Occlusion (ERCTO) registry (N=1,914), IVUS was only employed in 2.9 % of cases.17 This white paper presents evidence in support of the use of IVUS in the assessment of CTOs as well as introducing a workflow algorithm that can help support research and clinical decision making. VUS offers the potential to overcome technical challenges in CTO: isolated case reports describe the advancement of the IVUS catheter into a side branch to identify the entry point of the major branch and also advancement into a false lumen to enable visualisation of the true lumen.15,18–20 A small case series (N=31) showed that an IVUS-guided wiring technique is useful and safe for the recanalisation of stumpless CTO lesions.21 Another small case series (N=31) showed a high success rate of IVUS-guided reversecontrolled antegrade and retrograde tracking (CART) in CTO renanalisation procedures.22 However, concerns persisted regarding device-related complications and prolonged procedure times when using IVUS. Data on the relationship between successful CTO recanalisation using IVUS guidance and clinical outcomes after stent implantation are scarce. Larger trials have typically been underpowered to determine the impact of IVUS on outcomes, as event rates are generally low. In the Angiography Versus IVUS Optimisation (AVIO) trial, which included patients with CTOs, IVUS guidance provided no statistically significant advantage in major adverse cardiac events (MACE) up to 24 months.23 However, 48 % of patients did not meet the pre-specified IVUS guidance criteria. A subgroup analysis showed a significant difference in terms of the final minimum luminal diameter (MLD) between both groups. In a 2014 study of the Korean Chronic Total Occlusion Registry, IVUS-guided PCI was performed on 206 patients and propensity score-matched with 201 patients undergoing angiography guidance.24 At 2 years, the IVUS-guidance group showed significantly less ST than the angiographyguidance group (0 % versus 3.0 %; P=0.014) and a nonsignificant reduced incidence of MI (1.0 % versus 4.0 %; P=0.058). The rates of MACE were similar in both groups. In a 2015 study, 230 patients with at least one CTO lesion that had been recanalised successfully were randomly assigned to IVUS- or angiography-guided PCI.25 Lower in-stent late lumen loss (0.28±0.48 mm; 95 % CI [0.003–0.355]) and a lower rate of diameter stenosis (21.1±19.9 %) was reported in the IVUS-guided group, compared with 0.46±0.68 mm (95 % CI [0.001– 0.356]) and 29.2±24.6 % in the angiography-guided group (P=0.025 and P=0.002, respectively). However, there was no corresponding reduction in MACE, likely because the study was underpowered to demonstrate this. IVUS-guided stenting of CTO lesions had a lower rate of ST at 2 years, but the study was underpowered to demonstrate significance of this rare endpoint. 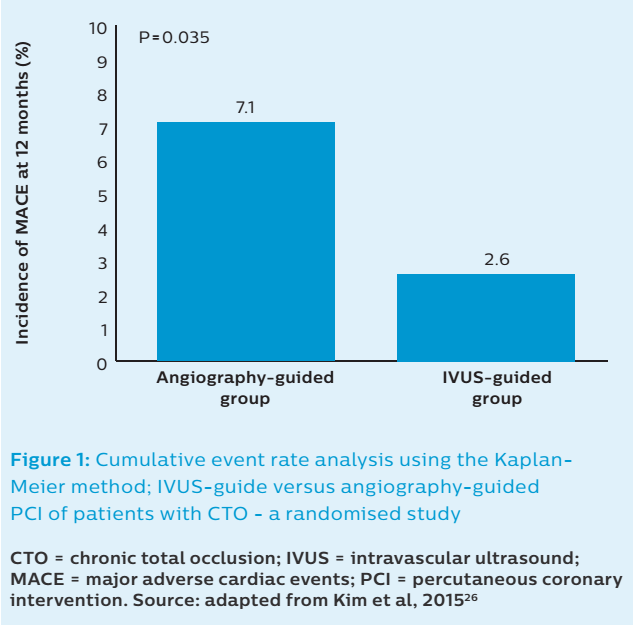 In another 2015 study, 402 patients with CTOs were randomised to the IVUS-guided PCI (n=201; randomisation occurred only when the wire successfully crossed the CTO) or angiography-guided PCI (n=201), and also underwent a second randomisation to Resolute zotarolimuseluting stents or Nobori biolimus-eluting stents. At 12 months, rates of MACE were significantly lower in the IVUS-guided group than that in the angiographyguided group (2.6 % versus 7.1 %; hazard ratio 0.35; 95 % CI [0.13–0.97]; P=0.035; see Figure 1).26 Outcomes were similar between the two stents. In addition, patients in the IVUS-guided group were more likely to receive highpressure dilatation after stenting with a higher maximum balloon pressure. Stenting resulted in a larger MLD in the IVUS group compared with the angiography group. The applicability of this approach is dependent on the angle between a side branch located at the probable location of the cap, and the further course of the occluded segment. The shallower the angle, the better. At angles >90°, the visualisation might not be possible. However, the location can still be identified from the step-up of the vessel size when the IVUS probe is pulled back from the side branch. The major information to be procured by imaging will be the location of the cap, the structure of the cap regarding calcification or rather soft tissue, and the size of the target. There are two ways IVUS can be used to support the engagement of the wire into the occlusion stump. The first is direct on-line guidance with the probe left at the site with the best view of the stump so that the wire position can be monitored on-line and a successful entry of the wire, ideally centrally, into the stump can be documented. This method requires large guiding catheters to fit together the IVUS catheter and the CTO microcatheter ≥7 Fr. A disadvantage is that the bulky IVUS probe may impair the free movement of the wire and engagement of the stump. The preferred wire to perform the penetration will be a tapered tip medium to stiff wire. If a guide catheter larger than 6Fr cannot be used, serial examinations with IVUS are performed so that the puncture is done at the site where the angiographic roadmap shows the IVUS transducer when the probe was detected, but without the benefit of a continuous IVUS acquisition. Once the puncture is made where the stump was visualised with IVUS, subsequent IVUS passes are needed to confirm the intraluminal position of the wire. Especially if the side branch is relatively parallel to the CTO vessel, the wire progression can be successfully monitored for at least the first critical few millimetres. The use of IVUS for stumpless lesions is highly recommended and may prevent subintimal entry at proximal cap due to the wrong identification of the CTO stump. Specific expertise in the use of IVUS for this indication is highly recommended and proctoring by an experienced CTO operator liberally using of IVUS is mandatory to extract the full potential information from the IVUS imaging. There are two basic situations to use IVUS in the event of a suspected subintimal wire position. One is to confirm luminal and subintimal space and the wire location, the other is to use this information for a guided entry with a second wire. The first task is easy to do when there is a great volume of plaque, but if the wire is subintimal in a narrow vessel with no atherosclerosis it is difficult to identify the possible intimal space because it may be pressed against the wall and almost invisible. To identify the position, it is required to perform a slow and careful pullback with several manual fore and backward movements. To advance the IVUS probe into the space of the initial guide wire it may be necessary to predilate the space by a small balloon ≥2 mm. If the subintimal position is confirmed, it is important to identify the point of exit from the luminal route. This is most often a spot of calcium within the vessel where the antegrade wire is deflected into the subintimal space. To perform a successful reentry into the true lumen, a second stiff wire, ideally a Confianza Pro 12g tapered tip wire with a sharp distal angle, is advanced parallel, supported by a microcatheter. Ideally, the puncture into the true lumen should occur at the site of deviation, because there is the biggest target for penetration. This is monitored by the IVUS probe in parallel position. Once the entry is achieved, the penetration wire should be replaced by a soft wire over the microcatheter to avoid a second exit into the false space. By this approach, the technique is not necessarily a re-entry, but an entry technique avoiding subintimal space. The entry should not be attempted too distal to where the intimal space might be compressed and renders a rather small target. This technique is one of the most difficult to learn in CTO recanalisation and its use is more successful in the capable hands of operators who use complex algorithms to identify the direction where the new wire should puncture/be steered to remain in the true lumen. There are basically two different situations in which IVUS is of advantage or even mandatory to conclude the successful retrograde approach for a CTO. First, it is the direction of the retrograde wire towards a proximal cap that is ambiguous or it is an ostial occlusion of the left coronary artery branch. 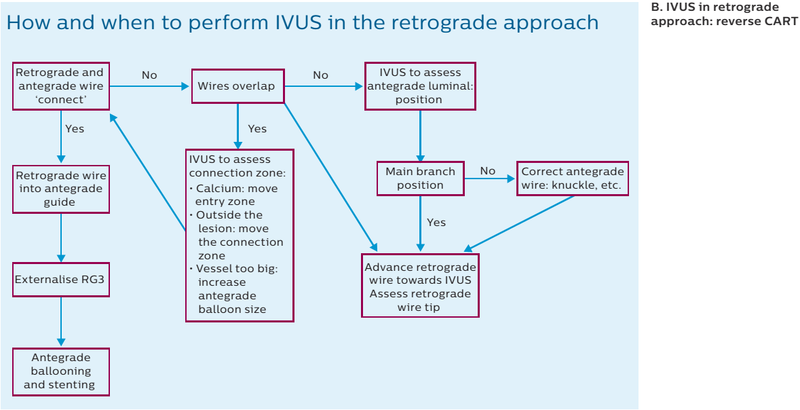 How and when to perform IVUS in the retrograde approach There is a high risk that the retrograde wire may enter the subintimal space and cause a dissection that may extend even towards the left main artery. In such a situation, a setup as described for the antegrade approach with an ambiguous cap is needed. The IVUS probe is positioned in a side branch close to the proximal cap to visualise the retrograde wire entry into the proximal lumen. The specific problem of an ostial occlusion of the right coronary artery does not allow the positioning of the IVUS probe antegradely. However, when in doubt whether the retrograde wire entered the aorta outside of the actual lumen or even ostium, an antegrade IVUS exploration after a low-profile balloon dilatation may help to avoid stent placement outside the arterial structure. The more typical situation for the IVUS use in the retrograde approach would be the clarification of problems in advancement of the retrograde wire. When retrograde wire crossing is unsuccessful, a dissection and re-entry retrograde technique is mandatory to achieve success. It is important to recognise the relative position of the antegrade and retrograde wires within the CTO body as either intimal or subintimal. To advance the IVUS into the body of the CTO a predilatation with at least a 2.0 mm balloon is required. Short-tipped IVUS probes are advantageous as the lead into the occlusion may be limited. 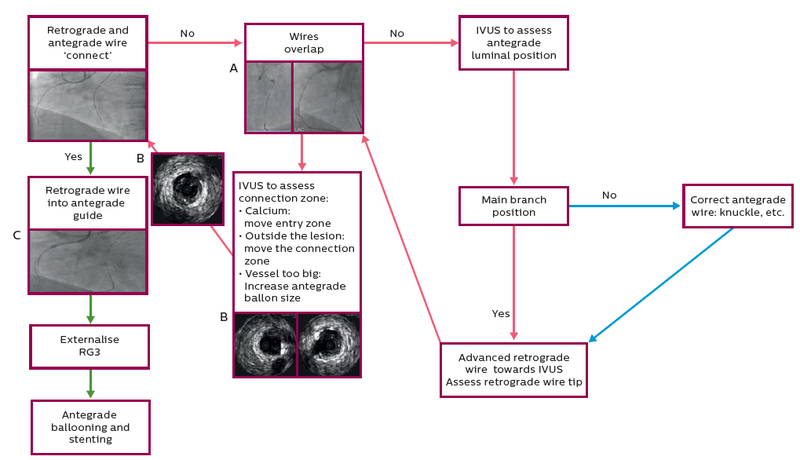 IVUS renders information to analyse the problem of lack of connection between antegrade and retrograde wire space. It may be due to heavy calcification or undersized balloon size for the reverse CART dilatation. 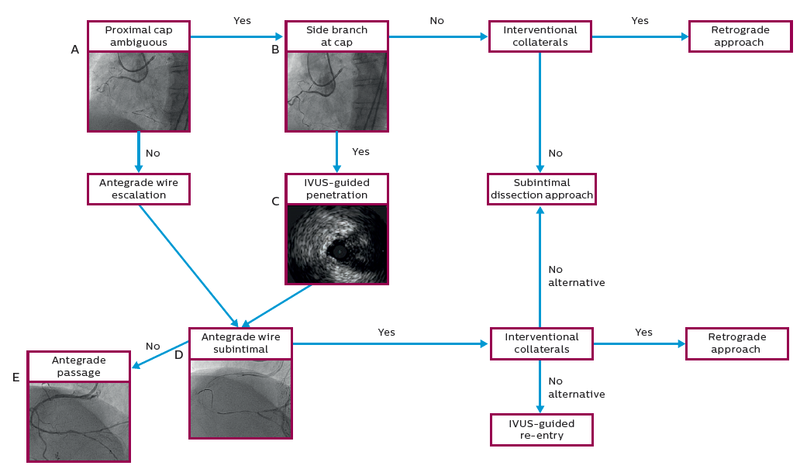 It is important to select the appropriate position within CTO vessel where to create connection between antegrade and retrograde guidewires (more proximally or more distally) when initial reverse CART strategy is unsuccessful due to severe calcifications. After opening a CTO, IVUS represents a useful tool able to provide information about lesion length, morphology and identification of a landing zone for stents implantation. After stenting, expansion, apposition and extension can be optimised with IVUS assessment. There is a need for more studies that compare IVUS and angiography guidance for drug-eluting stent implantation in CTO lesions. There is also a need for longer follow-up to investigate the impact of IVUS-guided procedures on coronary endpoints. However, recent studies suggest that the use of IVUS is beneficial in the recanalisation of CTO lesions. Fefer P, Knudtson ML, Cheema AN, et al. Current perspectives on coronary chronic total occlusions: the Canadian Multicenter Chronic Total Occlusions Registry. J Am Coll Cardiol 2012;59:991–7. Yang SS, Tang L, Ge GG, et al. Efficacy of drug-eluting stent for chronic total coronary occlusions at different followup duration: a systematic review and meta-analysis. Eur Rev Med Pharmacol Sci 2015;19:1101–16. Prasad A, Rihal CS, Lennon RJ, et al. Trends in outcomes after percutaneous coronary intervention for chronic total occlusions: a 25-year experience from the Mayo Clinic. J Am Coll Cardiol 2007;49:1611–8. Horisaki T, Surmely JF, Suzuki T. Contact wire technique: a possible strategy for parallel wire techniques. J Invasive Cardiol 2007;19:E263–4. Khand A, Patel B, Palmer N, et al. Retrograde wiring of collateral channels of the heart in chronic total occlusions: a systematic review and meta-analysis of safety, feasibility, and incremental value in achieving revascularization. Angiology 2015;66:925–32. Opolski MP, B OH, Berman DS, et al. Current trends in patients with chronic total occlusions undergoing coronary CT angiography. Heart 2015;101:1212–8. Jones DA, Weerackody R, Rathod K, et al. Successful recanalization of chronic total occlusions is associated with improved long-term survival. JACC Cardiovasc Interv 2012;5:380–8. Topol EJ, Nissen SE. Our preoccupation with coronary luminology. The dissociation between clinical and angiographic findings in ischemic heart disease. Circulation 1995;92:2333–42. St Goar FG, Pinto FJ, Alderman EL, et al. Intravascular ultrasound imaging of angiographically normal coronary arteries: an in vivo comparison with quantitative angiography. J Am Coll Cardiol 1991;18:952–8. Roy P, Steinberg DH, Sushinsky SJ, et al. The potential clinical utility of intravascular ultrasound guidance in patients undergoing percutaneous coronary intervention with drug-eluting stents. Eur Heart J 2008;29:1851–7. Levine GN, Bates ER, Blankenship JC, et al. 2011 ACCF/AHA/SCAI Guideline for Percutaneous Coronary Intervention. A report of the American College of Cardiology Foundation/American Heart Association Task Force on Practice Guidelines and the Society for Cardiovascular Angiography and Interventions. J Am Coll Cardiol 2011;58:e44–122. Dash D, Li L. Intravascular ultrasound guided percutaneous coronary intervention for chronic total occlusion. Curr Cardiol Rev 2015; [Epub ahead of print]. Nakatani S, Proniewska K, Pociask E, et al. How clinically effective is intravascular ultrasound in interventional cardiology? Present and future perspectives. Expert Rev Med Devices 2013;10:735–49. Furuichi S, Airoldi F, Colombo A. Intravascular ultrasound-guided wiring for chronic total occlusion. Catheter Cardiovasc Interv 2007;70:856–9. Authors/Task Force members, Windecker S, Kolh P, et al. 2014 ESC/EACTS Guidelines on myocardial revascularization: The Task Force on Myocardial Revascularization of the European Society of Cardiology (ESC) and the European Association for Cardio-Thoracic Surgery (EACTS)Developed with the special contribution of the European Association of Percutaneous Cardiovascular Interventions (EAPCI). Eur Heart J 2014;35:2541–619. Galassi AR, Tomasello SD, Reifart N, et al. Inhospital outcomes of percutaneous coronary intervention in patients with chronic total occlusion: insights from the ERCTO (European Registry of Chronic Total Occlusion) registry. EuroIntervention 2011;7:472–9. Ito S, Suzuki T, Ito T, et al. Novel technique using intravascular ultrasound-guided guidewire cross in coronary intervention for uncrossable chronic total occlusions. Circ J 2004;68:1088–92. Matsubara T, Murata A, Kanyama H, Ogino A. IVUS-guided wiring technique: promising approach for the chronic total occlusion. Catheter Cardiovasc Interv 2004;61:381–6. Ochiai M, Ogata N, Araki H, et al. Intravascular ultrasound guided wiring for chronic total occlusions. Indian Heart J 2006;58:15–20. Park Y, Park HS, Jang GL, et al. Intravascular ultrasound guided recanalization of stumpless chronic total occlusion. Int J Cardiol 2011;148:174–8. Rathore S, Katoh O, Tuschikane E, et al. A novel modification of the retrograde approach for the recanalization of chronic total occlusion of the coronary arteries intravascular ultrasound-guided reverse controlled antegrade and retrograde tracking. JACC Cardiovasc Interv 2010;3:155–64. Chieffo A, Latib A, Caussin C, et al. A prospective, randomized trial of intravascular-ultrasound guided compared to angiography guided stent implantation in complex coronary lesions: the AVIO trial. Am Heart J 2013;165:65–72..
Hong SJ, Kim BK, Shin DH, et al. Usefulness of intravascular ultrasound guidance in percutaneous coronary intervention with second-generation drug-eluting stents for chronic total occlusions (from the Multicenter Korean-Chronic Total Occlusion Registry). Am J Cardiol 2014;114:534–40. Tian NL, Gami SK, Ye F, et al. Angiographic and clinical comparisons of intravascular ultrasound- versus angiography-guided drug-eluting stent implantation for patients with chronic total occlusion lesions: twoyear results from a randomised AIR-CTO study. EuroIntervention 2015;10:1409–17. Kim BK, Shin DH, Hong MK, et al. Clinical impact of intravascular ultrasound-guided chronic total occlusion intervention with zotarolimus-eluting versus biolimus-eluting stent implantation: randomized study. Circ Cardiovasc Interv 2015;8:e002592.